The QuickBooks Desktop Enterprise Platinum Edition with advanced inventory provides you with flexibility to track and fulfill orders how you want to. With the ability to prioritize inventory, split orders, and add inventory, which automatically syncs with QuickBooks, you can pick and track orders to see where you stand in real-time. Enterprise Advanced Inventory helps you make informed decisions for your business and customers. You’ll have control and flexibility of your inventory whether you have one warehouse or multiple warehouses. With Enterprise Advanced Inventory, you’ll be able to determine which warehouse can fulfill an order, split orders, and more. Now two clicks is all it takes to see which filters have been applied to a report. Visible filters make it easy to reproduce memorized reports. The new filter tool also makes it easy to quickly toggle back and forth between reports. Save time with faster searching. Begin typing a name and QuickBooks automatically fills in the rest. No need to memorize account numbers. No need to search the full chart of accounts to find that one client. Plus, you can search between values to find a transaction without having to remember the exact amount. 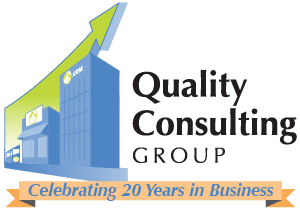 Call Quality Consulting Group at 1-877-723-7148 for more information, to schedule a free demo, or to purchase QuickBooks Enterprise Solutions. 1. Requires purchase of additional licenses, sold separately. All users must be on the same version year of QuickBooks to access the same company ﬁle. 2. Enterprise Solutions allows you to add up to one million names (e.g. customers, vendors, employees) and up to one million items (e.g. inventory, non-inventory, and service items). Some performance degradation is likely as your lists approach these size thresholds. 4. Requires Microsoft Excel 2002, 2003, or 2007. Company ﬁles must all be on the same version of QuickBooks Enterprise Solutions. 5. Requires Microsoft Ofﬁce 2003 or greater, sold separately. Does not work with Microsoft Ofﬁce Student Edition or Standard Edition. 6. Microsoft products sold separately. Word and Excel integration requires Microsoft Word and Excel 2000, 2002, 2003 or 2007. Outlook synchronization requires QuickBooks Contact Sync for Outlook tool, available for free at www.quickbooks.com/contact_sync/, and Microsoft Outlook 2000, 2002, 2003 or 2007. 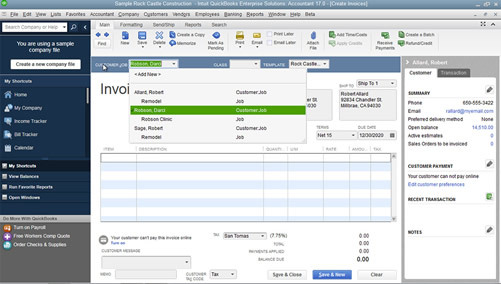 Synchronization with Outlook is also possible with QuickBooks Customer Manager (sold separately). 7. Additional fees apply for the Advanced Inventory add-on subscription. Users must be on QuickBooks Enterprise Solutions 12.0 and have an active Full Service Plan. 8. Some functionality may be limited when running two instances. See www.qbes.com/sysreq for more information. 9. Scanner not included. Only TWAIN compliant scanners supported. Maximum 100 MB per ﬁle. Total ﬁle storage 100MB or about 1,000 2-page PDFs. 10. Service provided by Wall Street on Demand. Additional fees may apply. Internet access required. 11. Additional fees may apply. Requires certain hardware, Microsoft Server operating systems, Microsoft Windows Server software licenses, and Remote Desktop Services Server Client Access Licenses, sold separately. For multiple remote users, a Remote Desktop Services Client Access License is required for each user. 12. Works with Outlook 2003 and 2007; Yahoo, Gmail and Hotmail require internet connection. Set up and schedule customized reports. Save time by making sure reports are pulled and sent to your team regularly. Remind Users of Undeposited Funds Clearly see which deposits require action with a new badge that displays the number of pending deposits. Easily track changes knowing that deleted users are marked as deleted and updates by them will show up in the Audit Trail attributed to them. Find the information you need faster with the ability to filter by vendor type and customer type. With connected services we’ve implemented measures like Multi Factor Authentication to keep your business safe. Now you can sort within a QuickBooks sales transaction by Item, Amount, QTY, etc., and the transaction will save and print the same as you see it. Now you can add a cost column to all your sales transaction. QuickBooks will display the current cost listed in the QuickBooks item list as the cost. In the past, it was only available in the Estimate, now it is in all the sales transactions. Do you have so many lines in your transactions that you often find it hard to find the line item you are looking for? Now you can search within a transaction for what you are looking for. In the past, it was cumbersome to find the quantities needed within a complex build assembly. Now you can create a Shortage report from within the Build Assembly so you can quickly determine what products you are missing to complete the build. Footer printing on last page only on multiple page sales and purchase transactions. Some of you have asked me in the future to have a Terms and Conditions that you only want to have on the last page…now you can have a separate footer page! QuickBooks running slow? 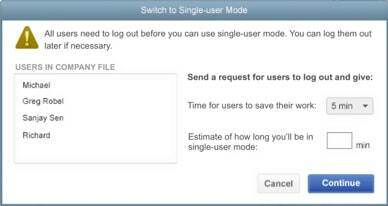 In 2015 you can have unlimited user cache so if someone is pulling up a large report, QuickBooks will allow them more cache to pull that report, significantly reducing the time the report takes to display. Do you have a need to total a column? Perhaps you have a custom column for weight on a sales transaction because you need to report the total weight of the shipment to charge your customer…now you have the ability to total any column in your sales transaction. We have heard for years that you don’t want QuickBooks to allow negative inventory. Now, you have that as a preference to turn on. 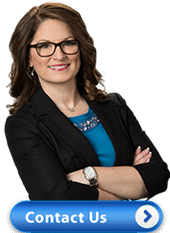 QuickBooks is one of the few that do allow you to go negative, and for some businesses, it is a necessary part of doing their accounting, but if not managed properly, it can cause issues with your data. With this new feature, if turned on, you will be able to prevent those negative numbers. Need to create comments on a report while in QuickBooks? Now you can! Estimates automatically close after they are converted to an Invoice. Column and filter for the “Other 1” and “Other 2” fields are available in reports. Active/Inactive filter is available on Names in 11 reports. Indicator when the Time/Costs window contains billable items. Ability to move subset of items from sales order to invoice. Don’t warn users when they add duplicate items on transfer if lots are enabled (QBES Only). Added-Preferred Delivery Method as a column to reports. Added-Preferred vendor as a column and filter in Stock Status Reports. Ability to add manufacturing part number column to Sales Orders, Estimates, and Purchase Orders. (For Sales Orders-Premier and QBES Only). Adding a warning when inactivating an item with any quantity on hand (positive or negative). One of the largest problem with using Inventory in QuickBooks was that users would inadvertently change their item receipt date by simply updating the bill date when the item receipt was converted to a bill. This would cause a temporary negative inventory, which over time caused some big file corruption issues and mistakes in financial statements. This feature allows you to separate those transactions into 2 unique transactions preventing the possibility of this happening again! You can choose if you want to have QuickBooks change sales prices automatically when the cost of the item changes. You can also set a global preference for the cost, and you can set overrides for individual items. You can add an images of your product in the item record for a limited amount of items. Price Level Lists up from 100 to 750, which will help some people. This will help for those companies that reply on more specific price levels for individual customers such as restaurant supply distributors. This is pretty big…many have asked in the past if you can have a find and select when looking for an item in QuickBooks. Now you will have it! If you have been using Advanced Inventory. • FIFO Inventory: Now you no longer have to revalue your inventory through adjustments, you can now manage your inventory cost of goods more accurately! • Serial or Lot Number Tracking : You can select to use wither Serial Numbers or Lot Numbers. This is a preference that is decided when you start to manage your Advanced Inventory. Access an organized, auto-populated calendar view of appointments, to do’s and important business tasks, such as invoice and bill pay deadlines. Export reports to Excel, modify and manipulate worksheet formatting and seamlessly apply formatting updates to new reports. Track prospective customers in one place, making follow up easy. Store and manage documents, such as contracts, proposals and receipts on your computer. Easily attach documents to forms, such as invoices. Centralize inventory tasks, items and reports for fast and easy access. Available in QuickBooks Premier 2012 only. Create timesheets for multiple employees or vendors who work the same hours at once. Eliminate the need to re-enter customer data into different transaction forms. Bill multiple customers at once for services rendered. Available in QuickBooks Premier 2012 only. With a paid subscription through the Intuit App Center, the App synchronizes customer data with QuickBooks to provide streamlined information to those in sales and management to eliminate data entry in two different systems, showing aggregated customer information alongside probability for closing a deal. The “To Do” list has been pumped up – now you have new features, and it is accessible from many new locations in the program. They are getting closer to making QuickBooks be a mini CRM product. You can specify actions to take, priorities, and much more. They’ve added a way to create a credit memo when you are in the Create Invoices window, which is very helpful. There actually are several “one click transaction” options here in a “Create” menu item. QuickBooks has numerous reports, and you can modify them to fit your needs. Now you can dicate who you share them with! This is an improvement on the “new company file setup”. Instead of going through the “interview” there is a quicker way for you to set up a new company file. Now if you export an Excel report and then make changes to it such as fonts and added information, you can save this as a template so that if you export that same report later, your modifications will continue to the newly exported report. In addition, you can update the data in your report from Excel itself without having first open the QuickBooks company file. Adds a search box to the task bar which lets you search for help as well as searching for information in your file. Is back and improved. You can now select how Inventory information is condensed, and more transaction situations are covered. You can also “strip” years out completely for those of you going though an IRS audit. Improves the work flow if you are invoicing multiple customers for billable time and expenses. Before your memorized transactions are entered, you can now see a list of them and select ones you actually want to enter before they are entered. View your transaction history within the transaction and make notes in the transaction note tab…all from within the transactin itself! No more having to enter a long memo in the transaction. See when it was emailed and more! If you had the 2011 R7 Plus update you saw that additional information was added to the No Company Open window, such as the file size and last date modified. One thing added then that I overlooked – the ability to edit the company list directly from this window. I like this improvement, now everybody gets it. 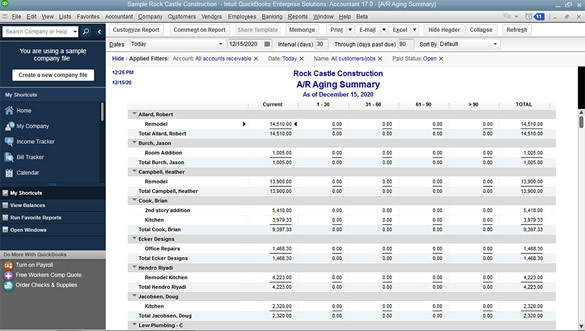 Enhancements to several key QuickBooks reports give users valuable business insights. New and improved reports capture customer and sales insights that help small businesses make better business decisions. QuickBooks Enterprise Solutions users can now create Proﬁt and Loss by Class reports that combine data from multiple company ﬁles. QuickBooks Enterprise Solutions users who have several funds, departments, or locations can now track them separately within a single, easy-to- access report. QuickBooks makes prioritizing customers easy by offering a consolidated view of customers’ purchase histories, average days to pay, and outstanding balances. This capability enables small business owners to make timely decisions on customer requests and identify top customers by revenue and payment consistency. View your customers history in graph format. See how long they have been a customer and what their average days to pay is. QuickBooks users now have the ability to complete their transactions faster than ever with at-a-glance views of important customer and vendor details. With instant access to customer payment history, estimates, and past orders with vendors on one screen, completing transactions is easy and fast. Users can now quickly locate any account, report or invoice details within their QuickBooks repository with a simple keyword search, then filter down your search results by type of list or transaction as well as prices. Small businesses who often invoice multiple customers for the same service can streamline the process with Batch Invoicing. Users create one template they wish to use, select the customers they wish to bill, and then Batch Invoicing automatically creates the full set of invoices. QuickBooks13 integrates with popular webmail services Yahoo, Gmail and Hotmail to make sending invoices, estimates, and other emails right from QuickBooks easy. You know better than anybody what business data you need to track and how you want to use it. More custom fields have been added to Enterprise Solutions for customers, vendors, employees and items so you can capture, track and report on the unique data you need. Set custom fields to accept certain formats such as date, phone number, or select from list to reduce data input errors and improve the quality of your data output. Plus use advanced filtering and sorting to run reports on the custom field information you care about. Save time by entering and editing your customers, vendors, item, or account information in bulk. You can even copy and paste data from other spreadsheets. Save time with new enhancements to Inventory Assemblies. Change quantity and item components on the fly to make substitutions or accommodate special customer requests. Add custom fields, such as serial or lot numbers, to track builds more closely than ever before. Plus print your build assembly with the click of a button and see the quantities needed to accurately build a job. Organize all your business documents in one place. Document Management lets you attach documents – electronic or scanned files – to any QuickBooks customer, vendor, employee, account or transaction. Because your documents are backed up online (up to about 1,000 2-page PDF’s), they are easy to share with your accountant and employees, and accessible from any internet connection. You can even scan documents right in QuickBooks. Stay on top of your business from a single screen, with data presented just the way you want it. Choose at-a-glance reports that are most crucial for managing your business. New report options include yearly expense and income comparison, detailed expense and income breakdown, and a top customer list. Get the insights you need to make more profitable business decisions. Now it’s easier than ever to find just the report you need to understand how your business is doing and spot opportunities to cut costs and boost profits. You can also tag your Favorite Reports to instantly access the reports you rely on most. Easily create financial statements with the reengineered Intuit Statement Writer, a $150 value included at no additional cost. Intuit Statement Writer links your QuickBooks Enterprise Solutions files with Microsoft® Excel so you can build and update professional statements. New enhancements let you create Microsoft Word-based reports and documents, create up to 16 statements within a single Microsoft Excel workbook, and send consolidated reports in PDF format. Plus, documents and statements can be saved as a custom report template for easy reuse. In response to the demands of our growing customers, QuickBooks Enterprise Solutions now supports up to 30 simultaneous users. You can easily add additional licenses as needed so your Enterprise Solutions can grow with your business. Grow your business globally with Enterprise Solutions’ new multi-currency capabilities. Apply and calculate foreign currencies automatically on transactions, such as sales orders, invoices and purchase orders, so you can do business with your international customers and offshore vendors more easily. International Payment Service: Connect to our international payment service right from Enterprise Solutions, making it easy for your business to process wire transfers and drafts in more than 100 foreign currencies. No need to go to the bank, you can send and receive payments online. The simple process takes you quickly from quote to payment, so you can get back to running your business. Now you can back-up, run reports, and enter transactions into your company file all within multi-user mode, allowing you to focus on what really matters, running your business. To improve performance in multi-user mode, Enterprise Solutions has upgraded to the Sybase 10 SQL database. Having trouble communicating with remote workers about what you need to do in Enterprise Solutions? Want to perform remote actions but your co-workers aren’t at their desk? QuickBooks Instant Messenger lets you now directly chat with remote users and perform actions, such as logging them out, even when they are not at their computer. Get quick, up-to-date company performance snapshots and custom reporting capabilities to help you make better business decisions with Intuit Business Analysis ES. It works seamlessly with Enterprise Solutions and is available exclusively for Enterprise Solutions users with an active Full Service Plan — at no additional cost. Securely download bank and credit card transactions to keep QuickBooks Enterprise Solutions records up to date. The short, step-by-step, Online Banking wizard will guide you through the set up process. Enterprise Solutions offers the most capacity of any QuickBooks product. Now you can have over 100,000 or more customers, vendors, and employees, and 100,000 or more inventory, non-inventory, and service items so there’s no limit to your growth. Protect your Enterprise Solutions data and any other business data with up to 25 GB of free online backup storage. Your data is stored in a private, secure and encrypted format at two separate locations. Online backup is a new benefit of the Full Service Plan. You may buy the same item in one unit of measure, stock it in another, and sell it in yet another. Enterprise Solutions 10.0 can automate the conversion from one unit of measure to another as the item moves through your business, helping you avoid costly mistakes. With a click, you can instantly convert from cases to pallets, or whatever units of measure you define. The correct units are then printed on invoices, purchase orders, sales orders, pick lists, and packing slips to help streamline your workflows and enable you to easily buy and sell products in precisely the way your vendors and customers prefer. Create estimates using different price levels and convert them easily to sales orders and invoices. The improved Payroll Center in Enterprise Solutions 12.0 adds functionality such as easy pay group scheduling, reminders and to-do list for tax payment due dates and electronic filing for tax payments. Submit your taxes and forms direcly to the IRS with a payroll subscription and enrollment to EFTPS online. Easily design and use custom forms with our improved auto preview feature. It allows you to customize your forms in real time so you know how they will look before you print them. Easily add your logo, use custom fields, and set fonts and colors to the more than 100 included templates for invoices and other business forms. Save time entering your business expenses with the new auto-categorize feature. Enterprise Solutions will automatically classify vendor information for commonly entered business expenses, making bill entry faster since you don’t have to go back to look up the right expense account for each vendor. Tax time is also streamlined. The improved QuickBooks Shipping Manager makes it easier to process FedEx, UPS, and USPS shipments and create shipping documents from within QuickBooks. Enterprise Solutions 8.0 adds support for thermal printer and multi-parcel shipping functionality so you can easily print labels and ship multiple packages from single shipment orders.